The City of Sheridan has is own street shop facility, located at 4343 South Clay Street. 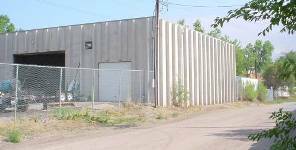 The current structure was built in 1987 and replaced an old Quonset building. The facility includes gas pumps for all City vehicles. The City has cooperative fueling agreements with the Sheridan School District and Columbine Valley. They reimburse the City on a monthly basis for all the fuel they use. The modest proceeds from these agreements are used to help offset the cost of maintenance on the tanks and pumps at the facility. A computerized program is used to track fuel usage. The silver box shown on the right of the pumps accepts electronic keys. The electronic key provides information on the vehicle. Mileage is input with a touch pad. As a result, all fuel usage, statistics, and billing information is provided by the computer. Sand and salt supplies are also maintained next to the shop, along with the storage of various vehicles and vehicle equipment. For more information about Sheridan's street shop, contact Public Works at 303-738-1098.